Gretchen is an Arizona grown musician from the time she entered a Phoenix public school 4th grade music instrument demonstration. Her teacher told her Mom that learning the viola “would not be as squeaky as learning to play the violin” and she has played it in every possible school opportunity since that Maryland Elementary School introduction. Her parents supported her by providing private lessons with Max Mandel for 8 years in addition to membership in the both the Phoenix Young People’s String Orchestra under the direction of William Bagwell and the Phoenix Symphonette. It was on a trip with that orchestra to play in Tucson that she fell in love with this town and asked her parents to help send her “away to college” to the University of Arizona where she earned a tuition scholarship to play in the U of A Symphony. Some of her teachers here were Oscar Iotti, Henry Johnson, James Oliver Buswell, III, John Ferrell and Teddy McMillan. After receiving her Bachelor’s in Elementary Education (with a slew of additional music credits), she left the state briefly to attend graduate school at Southern Illinois University in Edwardsville where she studied viola with Robert Scheiber and Suzuki Pedagogy and violin with John Kendall. 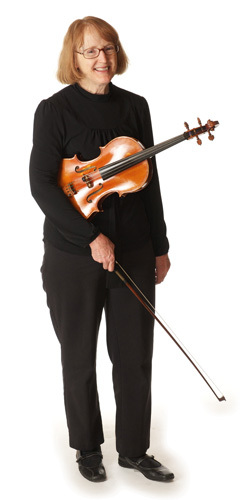 She returned to Tucson after earning her Master’s in Music Education to co-found a private Suzuki studio which introduced hundreds of youngsters to violin, viola, cello, piano and Orff for 9 years. Taking a short break to have two fantastic and now adult children, she taught in almost every private string program in the city until accepting a full time position teaching Orchestra and Violin classes in TUSD in 1997. Currently working at Fort Lowell/Townsend K-8 and Howell Elementary schools, she has the joyful privilege of touching nearly 185 children’s lives with music!